A friend of mine invited me to a barbecue a few weeks ago. A perfect day in the paradise that is the Orihuela Costa. The sun was shining, the drink flowing, and the coals were hot. Marinated chicken skewers, homemade burgers, and blue cheese stuffed chicken breasts. A glorious selection of meat, to be topped off by the pièce de résistance, prime sirloin steak. “What’s the matter, lad?” I asked. Here are the seven simple tips to cook a restaurant-quality steak that I shared with him. Steak tip #1: Cook dry! Always pat your meat dry with a paper towel before cooking. It will help you get that perfect sear on steak and help to contain the moisture in the meat (and, if you’re cooking chicken, the skin will come out beautifully crispy). Season the steak with salt and pepper both sides, immediately before cooking. Don’t season it and leave it. Seasoning helps to keep the moisture in, but the longer you leave it before cooking, the drier the meat will become. Always use tongs or a slice to turn the steak. Never flip it using a fork or knife. Pierce the meat, and those succulent juices will escape. The meat will lose its moistness, and some of those delicious flavours will be gone. That fantastic seared look and taste that you get at a restaurant and can’t replicate in the home kitchen is due to your fear of heat. Turn it up! Get that griddle smoking hot before you start to cook your steak. This heat will help to lock in those flavours, too, as well as give your steak a super caramelised brownness. When you’re cooking steak, don’t crowd it in. It needs room to breathe in that heat. We’re taught not to play with our food on the plate. Don’t play with it on the grill or in the pan, either! You only need to turn steaks once. Seriously. Have a sip of a cool beer while the first side is cooking. 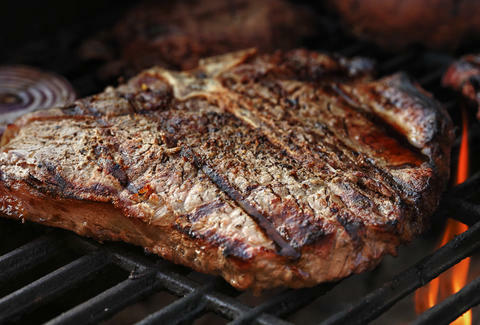 You should let your steak reach room temperature before cooking. If you don’t, and you take it from fridge to grill, it’s going to be cold on the inside. And that means it won’t cook like you expect on the inside. Once cooked, let your meat sit for a few minutes before serving. This allows the natural juices to flow though the meat, helping it to have that delicious flavour in every mouthful. Here at Christopher’s Restaurant in Torrevieja, we use the best produce from the best suppliers. And when it comes to cooking steak, we follow the above seven simple tips, add in a lot of love, and season our cooking with decades of experience. For that little extra something, call us on (+34) 600 01 28 24 to book your table and avoid disappointment.